Donald J Horowitz: And when you got there and you know, broadly, what did you find that you felt you really needed to do? You had had a number of comments from friends of yours before you took the job about, you know, shutting it down. DJH: And I guess I'd be interested in your impressions about what you found and what you thought you need-, you needed to and could do. And in fact, did, perhaps. Well, yeah. Well, no, I was able to play an assisting role. But there were already people here who were aware of the fact that there were certain fundamental structural problems that had to be addressed. In particular, I would say that President Pillay was aware, but in particular I would, I would identify the role of Judge Møse who was the Vice President when I arrived. He was very clearly aware that matters had to come to a head, matters had to change. The principle problem was this – you, here you have almost, in fact, at that time, very restricted courtroom facilities. You had three trial chambers with three judges, so that's nine judges. But they were all sharing fairly limited facilities. You had the Prosecutor who controlled the tap of the cases – turned it on and off – deciding how many people she wanted to arrest, how she was going to present the indictments, how they would go before the judges, and what crimes were going to be presented to the judiciary. And it was perfectly clear to anyone who came, particularly to me, coming in from the outside, but Judge Møse was already on top of the issue, that the Prosecutor's ambition to arrest well over 100 people, given the throughput, the capacity in terms of hours per week, per month, per year, of the judges working with the facilities we had, the tribunal would last for two decades, at least. And that was manifestly, politically unacceptable. And something had to be done. The Prosecutor had to change. When I arrived, the Prosecutor was Carla Del Ponte, a wonderful woman who one would be very anxious to go in on a frontal beach assault in Iwo Jima with her, with her holding a Kalashnikov. I mean a very brave and a very, very strong wo-, woman, a strong leader. DJH: Where was she from? She was from Italy and had cut her judicial teeth fighting the mafia and with, with great success, according to her press conferences. And she had definitely got a very strong approach to prosecution here. But of course, she divided her responsibilities with, between pro-, prosecuting at The Hague and prosecuting here. And what she tended to do was to arrive here a bit like the Queen of Hearts, arriving, giving orders, developing, meeting people, and then disappearing very fast. And . . . yeah. DJH: Let me stop you for just a moment. You said she was prosecuting at The Hague and here? So she wasn't just assigned to this court, she was assigned to both ad hoc courts? Yeah. 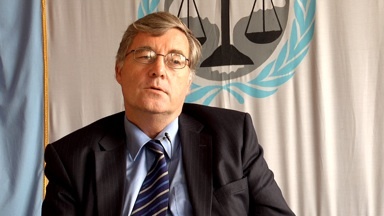 Originally, when the Security Council set up the Rwanda tribunal, they felt that it was important to ensure harmony, to some extent, of both the prosecutorial policy and the jurisprudence. So they produced a common prosecutor and a common-, a commonality between the appeals chambers. So, in other words, the appeals chamber at The Hague with a couple of additions became our appeals chamber. DJH: Okay. Why don't you go back? You were saying she arrived like the Queen of Hearts and then . . . ? Yeah, there were a few sort of "Off with your head" moments, and then she would disappear off back to The Hague and there was a certain amount of concern as to whether management here was – in the prosecution – was actually as long-term visionary as it should be. So you know, to some extent, when you're dealing with that style of leadership, it's a remarkably good style of leadership, but when it comes to actually trying to run a rational organization, there are other considerations have to be brought into effect. So we had, if I conflate the story a bit – because it could go on an awful long time. There was a meeting of all the judges of both tribunals in Dublin under the auspices of the Dublin government and under Trinity College Dublin, at which we met Hans Corell, the legal counsel as was then of the Secretary General. And at which these issues were thrashed out – how are we going to put the ad hoc into these tribunals? How are we going to eventually address ourselves to closing it down? And one obvious message that came out between, in the work of the judges, was basically with the resources we have at the moment, and the tap going at the rate it-, it's going, flowing at the rate it's going from the Prosecutor, we have got a problem terminating these tribunals. So therefore, we need to address both the tap and the resources. Increase the resources and restrict the tap. That's, if I can summarize it, more or less, that's what went on behind the scenes. Do – I think you're going to be talking to Judge Møse – talk to him about it, because he was the, very instrumental in developing the, the way forward from Dublin. So as a result of that, the completion strategy documents started to be pre-, planned and prepared. And it, it was fairly traumatic, because, certainly here, it was necessary for the Prosecutor to understand that it was impossible to have that particular number of persons arrested and dealt with. And in due course, after a few Iwo Jima moments, if I can put it like that, we did eventually have, the prosecution addressing itself, to a considerably, considerably, fewer numbers of indictments. DJH: Okay. So that was the, one of the first parts of the job that you were involved with. Yeah . . . Yes. I was in support of the President there. And of course, at the same time we also had to increase our resources. And eventually, that message was sold to New York. They did increase our resources. We increased the courtroom capacity, we increased the judges, we added ad litem judges, another nine to our capacity, so we had 18 judges, so that we could sit two subsections of each trial chamber. And so on. And we then ra-, we actually started to sit in shifts. Morning shifts, afternoon shifts. We elongated the work time of the tribunal and so on. Got things moving. We doubled, more than doubled the number of legal staff in chambers; we, we, we increased our staff enormously. So it was, it was a difficult message for New York to grasp, that in effect, if you wanted to close down this institution, you've got to increase the resources to increase the throughput to get it closed. DJH: When you say New York, you mean UN headquarters?